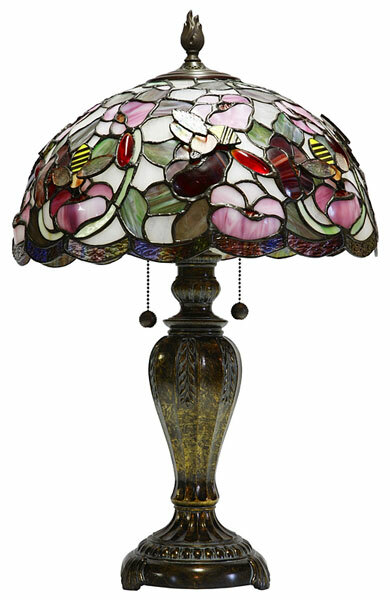 A colorful Tiffany glass table lamp is photographed on a white background. When the chain on the lamp is pulled, the interior bulb will shine through the intricately patterned pink, green, yellow, and brown stained glass to illuminate the room. There are few things as beautiful as light streaming through a colorful, intricate Tiffany lampshade. Louis Comfort Tiffany's first lamps were shown at an exhibition in Paris in 1896. While no one is completely certain, it has been hypothesized that Tiffany lampshades were a result of the extra, unwanted glass that Tiffany stored in his Corona factories. These factories stored the glass used for leaded windows. While much of the glass was perfectly usable, it was too small to be used in the windows. It was, however, perfectly usable in smaller, decorative items such as lampshades. The lampshade process differed slightly from the window process, however. Due to the smallness of the glass pieces, they had to be pieced together using a method that incorporated copper foil, beeswax, glue, and acid, rather than the lead method that was used to piece together the windows. Tiffany lampshades were introduced around the same time as electric lighting. While electric lighting had many advantages, it was known for being significantly harsher than gas lighting. Tiffany lampshades diffused the harsh light and created a warmer, gentler glow that quickly became very popular. By 1900, Tiffany was producing lampshades for table lamps, floor lamps, wall lamps, and chandeliers. Tiffany lampshades eventually became so popular that production lines had to be set up. Most Tiffany lampshades features natural themes such as hydrangeas, poppies, poinsettias, flowering lotus, bamboo, and cherry.